Supports dual displays via a VGA and a HDMI port. Gigabit LAN. Audio jack (Headphone/MIC). Ultra compact PC design – 0.69L (56.1x 107.6 x 114.4mm). 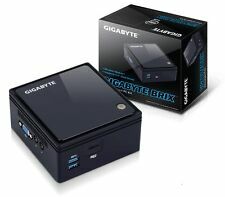 Barebones GIGABYTE Brix Pro Compact PC Kit. New & sealed. VESA Bracket. 2.5" SATA HDD. What's NOT Included. Processor socket: BGA 1296. Supported storage drive types: HDD, Storage drive sizes supported: 2.5", Storage drive interface: Serial ATA III. The BRIX supports native resolutions of 4K at 60Hz, presenting unrivaled visual clarity and stunning realism to owners of UHD displays. Processor Model N2807. More from the Manufacturer. Product Line BRIX. Manufacturer GIGABYTE Technology, Inc. Processor Type Celeron. Redefining the Desktop PC. Product Type Desktop Computer. Ethernet Technology Gigabit Ethernet. LAN Gigabit LAN (Realtek RTL8111H). VGA Resolution (Max.). 1920 x 1200 @60 Hz. HDMI Resolution (Max.). 3840x2160 @ 30 Hz. Rear I/O 1 x HDMI. Side I/O 1 x VGA D-Sub. System Storage Temperature: -20°C to 60°C. Processor socket: BGA 1296. Supported storage drive types: HDD, Storage drive sizes supported: 2.5", Storage drive interface: Serial ATA III. The BRIX also bundled with a VESA bracket, it can easily be mounted behind a monitor or HDTV making it discreetly hidden from view. Processor socket: BGA 1356. Supported storage drive types: HDD,SSD, Storage drive sizes supported: 2.5", Storage drive interface: Serial ATA III. The BRIX supports native resolutions of 4K at 60Hz, presenting unrivaled visual clarity and stunning realism to owners of UHD displays. Bundled with a VESA bracket, the BRIX can easily be mounted behind a monitor or HDTV making it discreetly hidden from view. This makes it simple and effective way to turn any VESA-compliant display or TV into a full-featured PC or digital signage unit. With leading performance and security, robust build quality and the Input/output (I / O) flexibility, GIGABYTE BRIX IoT is made a perfect fit for various IoT applications. Rich in Connectivity Options GIGABYTE BRIX IoT ensures you won't be hindered by lack of connections. Product weight 912 g. Lithium battery weight: 1 g. Manufacturer model number: GB-BXBT-2807. Number of lithium-ion batteries: 1. I / O: USB 3.0 1, USB 2.0 2, RJ 45 1, DC-In 1, Kensington lock slot. Challenging the essence of how we define a desktop PC, GIGABYTE engineers have developed an ultra compact PC with a stylish design based high polish surface chassis. The BRIX also bundled with a VESA bracket, it can easily be mounted behind a monitor or HDTV making it discreetly hidden from view. Gigabyte GB-BXi7-4770R Brix Pro Ultra Compact PC - Good Condition! The GIGABYTE BRIX Pro also supports the latest 4K displays via HDMI. ® Iris™ Pro graphics 5200. Bundled with a VESA bracket, the BRIX Pro can easily be mounted behind a monitor or HDTV making it discreetly hidden from view. Supports dual displays via a VGA and a HDMI port. Gigabit LAN. Gigabit LAN (Realtek RTL8111HS). VGA Resolution (Max.). HDMI Resolution (Max.). 1 x HDMI (1.4). Ultra compact PC design – 0.69L (56.1 x 107.6 x 114.4mm). 2 x USB3.1 (1 USB Type-C™). 1 x USB3.1. HDMI plus Mini DisplayPort Outputs (Supports dual displays). HDMI Resolution (Max.). 3840 x 2160 @ 60Hz. (HDMI 2.0 and HDCP 2.2 ). Rear I/O 1 x HDMI (2.0). Ultra compact PC design at only 0.6L (46.8 x 112.6 x 119.4mm). Mini DP Resolution (Max.). DP1.2a ws HDCP 2.2. HDMI Resolution (Max.). HDMI2.0a ws HDCP 2.2. Rear I/O 1 x HDMI(2.0a). 1 x Mini DisplayPort (1.2). System Storage Temperature: -20°C to 60°C. 1 x head phone jack with MIC. Supported storage drive types: HDD,SSD, Storage drive sizes supported: 2.5", Storage drive interface: M.2,Serial ATA III. The BRIX also bundled with a VESA bracket, it can easily be mounted behind a monitor or HDTV making it discreetly hidden from view. Gigabyte PC/workstation barebone BGA 1090 1.50 GHz J4105 Black,WhiteCeleron J4105 2.5 GHz - 1x SO-DIMM DDR4 - LAN - Wi-Fi - Realtek ALC891 - HDMI 1.4b - 2x USB 3.0 - VGA - PCIe - 3.5mm - 56.22x103x116.52 mmGigabyte GB-BLCE-4105C. Challenging the essence of how we define a desktop PC, GIGABYTE engineers have developed an ultra compact PC with a stylish design based on a brushed aluminum surface chassis. The BRIX also bundled with a VESA bracket, it can easily be mounted behind a monitor or HDTV making it discreetly hidden from view. 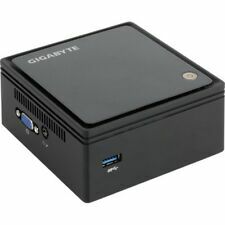 Gigabyte PC/workstation barebone BGA 1090 1.10 GHz N4000 Black,WhiteCeleron N4000 2.6 GHz - 1x SO-DIMM DDR4 - LAN - Wi-Fi - Realtek ALC891 - HDMI 1.4b - 3x USB 3.0 - USB 3.0 C - VGA - PCIe - 3.5mm - 56.22x103x116.52 mmGigabyte GB-BLCE-4000C. 1 x USB3.1. HDMI Resolution (Max.). 4096 x 2160 @ 60Hz. (HDMI 2.0 and HDCP 2.2 ). Rear I/O 1 x HDMI (2.0). Mini DP Resolution (Max.). 3840 x 2160 @ 60Hz. 1 x Mini DisplayPort (1.2). Chassis type UCFF. Manufacturer: Gigabyte. Challenging the essence of how we define a desktop PC, GIGABYTE engineers have developed an ultra compact PC with a brushed aluminum surface chassis design. ® Processor N3000 up to 2.08GHz. LAN Gigabit LAN (Realtek RTL8111H). VGA Resolution (Max.). 1920 x 1200 @60 Hz. HDMI Resolution (Max.). 3840x2160 @ 30 Hz. Rear I/O 1 x HDMI. Side I/O 1 x VGA D-Sub. 2 x SO-DIMM DDR4 slots. Manufacturer: Gigabyte. HDMI plus Mini DisplayPort Outputs (Supports dual displays). VESA Mounting Bracket (75 x 75mm 100 x 100mm). Office Products. Printers & Scanners. We’re here to help. Gigabyte GB-BKi3HA-7100 Core i3-7100U DDR4 HDMI/mini DP/2USB3.1GB-BKi3HA-7100 / RBGBAPII7100U00. Rodzaj pamięci: SODIMM DDR4. Zainstalowana pamięć RAM: 0 KB. Pojemność zainstalowanych dysków: 0 KB. Porty wideo: 1 x HDMI, 1 x Mini DisplayPort. Prozessor N3350. Prozessorsockel BGA 1296. Prozessor-Taktfrequenz 1,10 GHz. Prozessor Boost-Taktung 2,40 GHz. RAM-Speicher maximal 8 GB. Grafikkarte HD Graphics 500. Prozessor Lithografie 14 nm. Gehäusetyp 0,69L Größe PC. Prozessor N4200. Prozessorsockel BGA 1296. Produkttyp Mini-PC Barebone. Prozessor-Taktfrequenz 1,10 GHz. Prozessor Boost-Taktung 2,50 GHz. RAM-Speicher maximal 8 GB. Prozessor Lithografie 14 nm. Höhe 27 mm. Produkttyp Mini-PC Barebone. Prozessor-Taktfrequenz 2,2 GHz. Prozessor Boost-Taktung 3,4 GHz. RAM-Speicher maximal 64 GB. Gehäusetyp 0,46L Größe PC. Breite 112,6 mm. Temperaturbereich bei Lagerung -20 - 60 Â°C. Gigabyte GB-BACE-3000 Celeron N3000 DDR3/SO-DIMM/USB3GB-BACE-3000 / RBGBAPIICN30000. Zainstalowana pamięć RAM: 0 KB. Pojemność zainstalowanych dysków: 0 KB. wielkość pamięci: 8 GB. Wymiary: 56.1 mm x 107.6 mm x 114.4 mm. RAM-Speicher maximal 8 GB. Zur Verfügung stehende Vertragssprachen Anzahl installierter Prozessoren 1. Weitere Spezifikationen. Tastatur enthalten Nein. Maus enthalten Nein. Anzeige enthalten Nein. Höhe 114,4 mm. 2 x SO-DIMM DDR4 slots. HDMI plus Mini DisplayPort Outputs (Supports dual displays). VESA Mounting Bracket (75 x 75mm 100 x 100mm). Office Supplies. Networking & Servers. Monitors & Projectors. Dual Array Microphone. Gigabyte GB-BRi7H-8550 i7-8550U 1.80 GHz UCFF Black BGA 1356. Chassis type UCFF. Challenging the essence of how we define a desktop PC, GIGABYTE engineers have developed an ultra compact PC with a brushed aluminum surface chassis design. 1x SO-DIMM DDR3L 1.35V slot. Gigabit LAN (Realtek RTL8111G). Based on the Silvermot micro-architecture, utilizing the 22nm process technology. Supports 75 x 75 and 100 x 100 mm. Expansion Slots. Warranty Information. Ultra Compact PC Design with 4k Resolution Output via HDMI. Pc Kit is new in box. Exactly as photographed. 1 x Mini DisplayPort. 1 x head phone jack with SPDIF. 1 x Kensington lock slot. Other Rear Ports. Note: This is a barebones PC with the capacity for 8GB RAM and 1TB HDD. However, RAM and Hard Drive are NOT included. Supports dual displays via a VGA and a HDMI port,Gigabit LAN. Audio jack (Headphone/MIC),VESA mounting bracket (75 x 75mm 100 x 100mm).